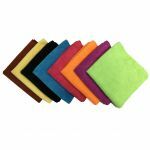 If purchasing 96 pieces or more please visit our Microfiber Wholesale Section for the bulk discounted price of $1.36 per towel. Our microfiber “salon” towel has a 400GSM rating and is part of our premium line. It is an extremely plush and high-density towel. The salon towel has our highest water absorption ability, and can hold up to 25 times its weight in water! 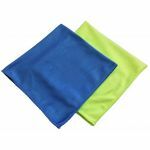 As the name implies, it is very often used in salons for drying hair, however, the salon towel is used in several other industries too. It is actually used more often by auto detailers and car washes as drying towels. It is also used in the cleaning industry, for cleaning up spills quick and easy. Great are around the house, garage, inside car etc, micro fiber towels. Big enough to do the big jobs. They also make a nice towel to put down on the counter next to the coffee pot and grinder. When it gets dirty just throw it in the wash. My wife likes the smaller micro fiber towels 12x12 for cleaning she thinks the larger towels get too heavy when loaded with water. 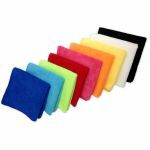 I bought a bunch of these microfiber towels a few months back to use in my car wash, and they are awesome. I bought 350gsm towels to use for cleaning the interior windows on customer vehicles, and I use these 400gsm towels to dry all of the clean cars as they come out of the tunnel. These towels are very soft, and they can dry a car better than any other microfiber towel I have seen before. I use a microfiber detergent only to clean my towels and I haven't had to go into the closest in 3 months to take out any more new towels. Very happy customer!